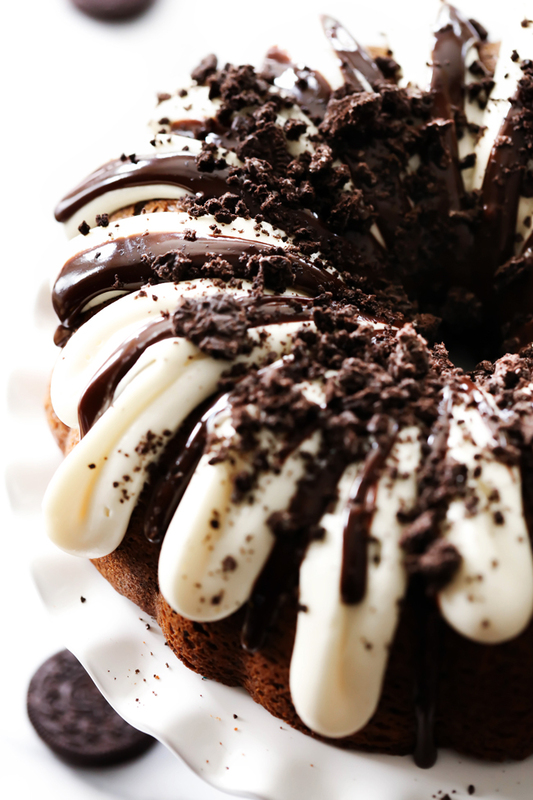 This Cookies and Cream Bundt Cake is divine. It is loaded with Oreo cookies. It is super moist and is topped with cream cheese frosting that compliments the chocolate cake perfectly! Bundt Cakes have been one of my go-to desserts lately. Particularly this base bundt cake recipe. I have such a huge variety here on the blog that you are bound to find one that is perfect for you. 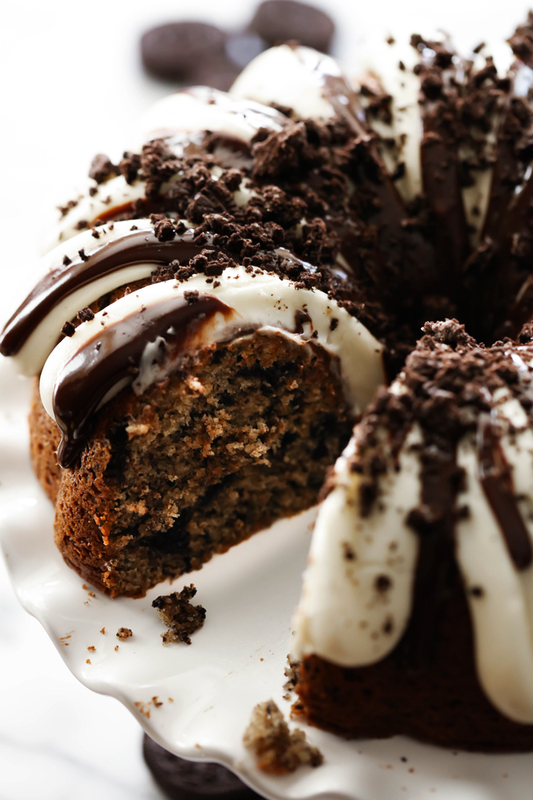 This bundt cake recipe produces such a moist and delicious cake. 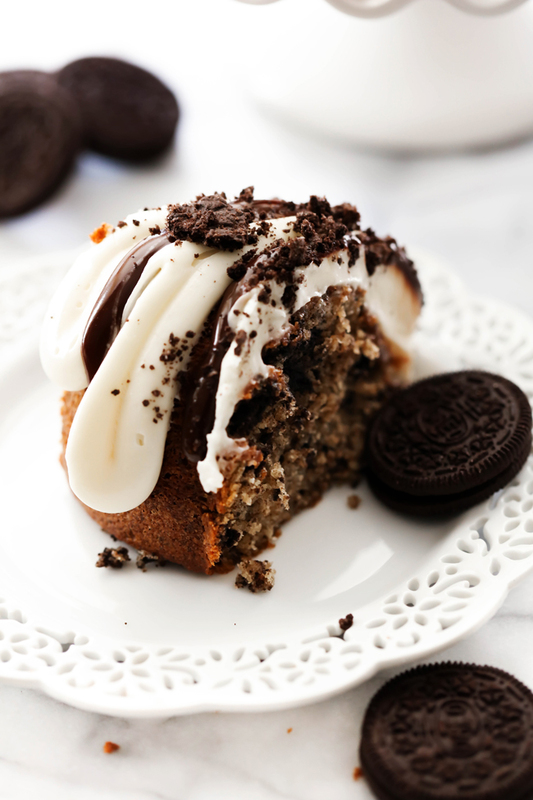 This particular recipe is loaded with Oreo cookies and is perfect for all cookies-and-cream lovers! It is topped with a wonderful cream cheese that compliments the cake perfectly. This cake is truly a crowd pleaser and will be an instant hit! In a large bowl, mix all ingredients together for 3 minutes on high. Stir in Oreos. Pour into a greased and floured bundt pan. Soften fudge in microwave for 30 seconds. Drizzle over frosting. Sprinkle chopped Oreos over the top. This looks delicious. I'm going to try it. One question, is the pudding a Cook and Serve pudding or an Instant pudding? Thank you. The recipe says white cake mix and vanilla pudding but the picture shows a chocolate cake? Which one? Made this for my dad's birthday and it was a hit! Thanks for the great recipe! I know I'm late to the party with this, but I am going to make it tomorrow!! My question is, when you chop the oreos for the cake do you do them like in a blender for fine crumbs or just chop little pieces with a knife?? I know that's probably a lame question -- sorry!! Thanks for all your yummy recipes!! Made this for a work Christmas party, was an absolute hit! Delicious! Tonight I make it for a bake sale. Looking forward to seeing what it sells for.